This beat up 1967 Fairlane owner’s manual is something special because it once belonged to the King of Rock and Roll. Elvis took his fiancée Priscilla Beaulieu on a road trip to show her his hometown of Tupelo, Mississippi in early 1967. On the trip, he bought the Circle G Farm Ranch in Horn Lake, Mississippi as a getaway from life in the city. It later became known as “Honeymoon Ranch.” The Ranchero was for tooling around the farm. 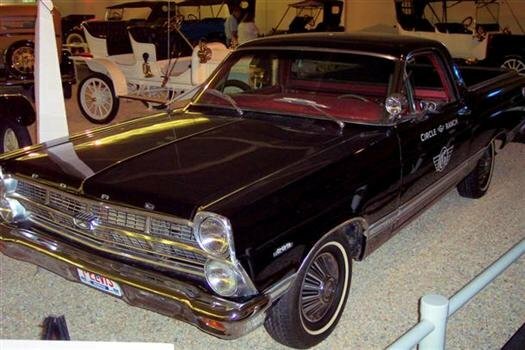 The Museum of Automobiles at Petit Jean Mountain in Morrilton, Arkansas has a black 1967 Ranchero from Elvis’s ranch along with the original paperwork from when he bought the vehicle. That Ranchero was bought on Valentine’s Day 1967. This owner’s manual is from a Ranchero bought ten days earlier, on February 4, 1967 and has a different serial number – so he must have had at least two Rancheros. The pressures of a busy life led Elvis to sell the ranch after less than a year, and to trade in the black Ranchero now in the museum for a Cadillac. The car that our book belongs to, a blue Ranchero 500 equipped with a 289 engine, was sold at an Elvis memorabilia auction at the MGM Las Vegas in 1999. Even though the cover of this book says Fairlane, it is the correct manual for a Ranchero – Ford considered the Ranchero to be a body style of Fairlane. The book includes Ranchero-specific specifications and instructions where necessary. If you need to find the right owner’s manual for your classic ride, give us a call or visit our website!